Geneva/Switzerland, October 20, 2016 – BlueOcean Ventures SA announced today that it has acted as lead investor in a new financing round in Rheon Medical SA, which is developing the world’s first adjustable glaucoma drainage device. “Rheon Medical’s Founder and CEO, Prof. Dr. Nikos Stergiopoulos, is a reknown serial entrepreneur being a founder of EndoArt SA, sold to Allergan in 2007, and Antlia SA. BlueOcean Venture’s team is delighted to join Rheon Medical as the first institutional investor.” said Thomas Zehnder, General Partner of BlueOcean Ventures. “We like very much the operational experience of the BlueOcean Venture team and are pleased to welcome Thomas Zehnder in our board of directors,” Nikos Stergiopoulos, Founder and CEO of Rheon Medical pointed out. Rheon Medical SA, based in the EPFL Innovation Park, Lausanne, Switzerland, is developing and distributing the world’s first adjustable glaucoma drainage device. 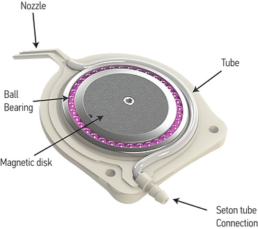 The feature product is the eyeWatchTM implant, which has been implanted since September 2015 and is currently being evaluated in a European multi-center study. BlueOcean Ventures invests in early stage medical device and life science companies since 2008. Unlike other funds the four General Partners of BlueOcean Ventures, Faris Sabeti, Emmanuel de Watteville, Sacha Haymoz and Thomas Zehnder, have a long-standing track record in building, managing and coaching start-up companies. BlueOcean Ventures supports their portfolio companies with a large network of experts and industry contacts.